My quilting world was just rocked recently in the best way! 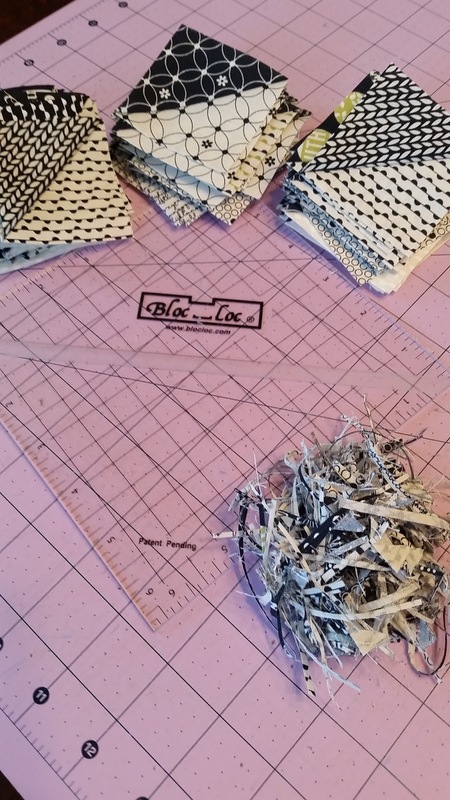 I finally discovered Bloc Loc Rulers! I am usually the last person to try a new tool – typically time, money or awareness keeps me from doing so – but once I do, I’m likely to be a fan for life. That is true for Bloc Loc! I had never even heard of Bloc Loc until a couple of months ago (which is crazy considering I don’t live far from where they’re made!) Several patterns I’ve designed are full of HSTs (half square triangles), so it felt like it would be a good fit. Of course I had to wait for a sale and since one of my LQS’s had one recently, I picked up the 6.5” x 6.5” HST ruler. I felt like that covered all the main sizes of HSTs that I make. I watched the quick tutorial on the Bloc Loc Ruler website, as well as a few for their other rulers. They have super quick and easy to understand videos. I just designed a new pattern and had cut out the fabrics. I have 216 2.5” x 2.5” HSTs to create and square up, so I got started with my new ruler. It works amazingly! I showed my husband the difference between a regular ruler and Bloc Loc (we’re both big hobbyists, so he appreciates the value of good tools). With a regular ruler, it can’t sit flat with the bulk from the HST. The ruler can easily slip – I’ve had to remake more than one HST in my day because I accidently sliced up an HST after my ruler moved. Also, it can be difficult to line up everything perfectly. Bloc Loc rulers have a small groove in the center, which allows it to sit on top of the bulk and keep the ruler in place. It makes it easier to line up, trim, flip and trim the other side. And the result is awesome! As I mentioned above, I’m usually the last to try a new tool. It’s not because I don’t love new tools and want to own one of everything, but I am a true fabric hoarder at heart. When I look at the cost of quilting tools, I think about it in terms of how much fabric I could buy. Fabric usually wins. Also, sometimes I don’t have a strong need for a tool and can’t justify purchasing it. Finally, somehow I still deal with lack of awareness (and I’m an Instagram-loving, LQS-frequent shopper, quilting-blog reader!). Thankfully I’m up to speed now on Bloc Loc and hopefully you are now too! If you use Bloc Loc, which rulers do you own? *No, just in case someone wonders, no one asked me to write about Bloc Loc. I love to share good tools and resources I find and share my own opinion about them. I love Bloc Loc, Wonder Clips and Add-A-Quarter – no one pays me to love them, I just do.